Oh I’ll definitely have to try those as I hate the Cross pen refills, too (for the same reasons as yours)! I despise cross refills.. With a passion. Weak and anemic as they are. They only serve to frustrate and confound me as I am more accustomed to dark, substantive writers, in fountain pens as well as ballpoints. I was on the search for a better refill since I had the same dilemma as you. I managed to find something marginally better than what comes in those pretty cross pens which can’t write so pretty. Monteverde makes cross style refills that are widely available at staples. I picked up mine from fry’s electronics. Schmidt also makes some decent refills with Private Reserve ink in them. 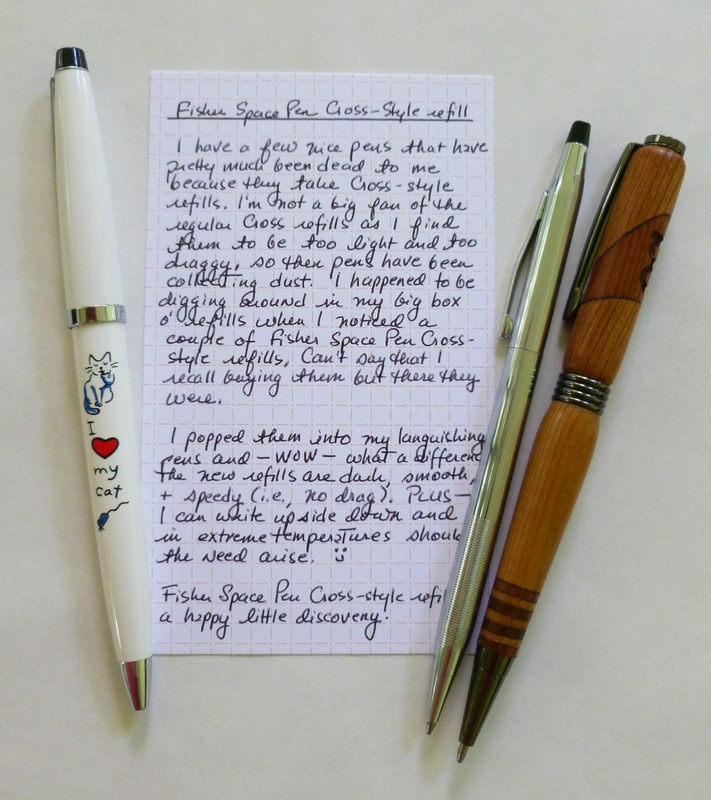 I picked up some refills for my Parker Jotter which are called EasyFlow 9000, and they are actually quite good. The Monteverde Cross refills come in packs of 2, so I had setup mine as well as my wife’s cross with these refills and now they write much more satisfactorily (if that’s even a word). 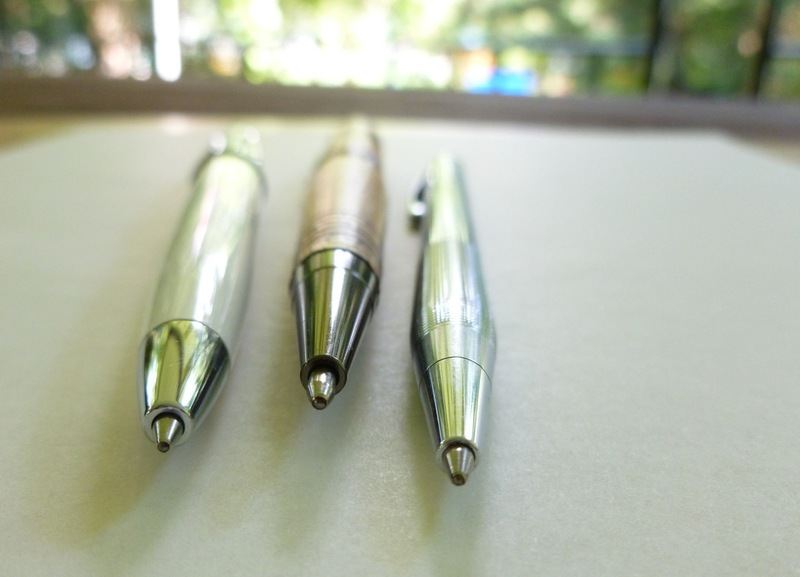 I’ve used the Monteverde Cross-style refills in the past and they ARE quite decent. I was out of those so popped in the Fisher ones and was happy to see how well they wrote. I love the Schmidt EasyFlow 9000 (or equivalent, such as the Private Reserve you mention) and use them often in pens that take that style. One would think Cross would re-formulate their ballpoint ink, but alas! Yes…I’ve written to Cross several times but their ballpoint refills especially the blue ones keep getting worst and worst. I don’t understand why they cannot fix them but they don’t. Their bold point ones are a bit better but the point size is really too big. Their refills are always available though at any Office supply store. Recently they’ve come out with the Cross Click…a Century type pen that takes their gel refill. 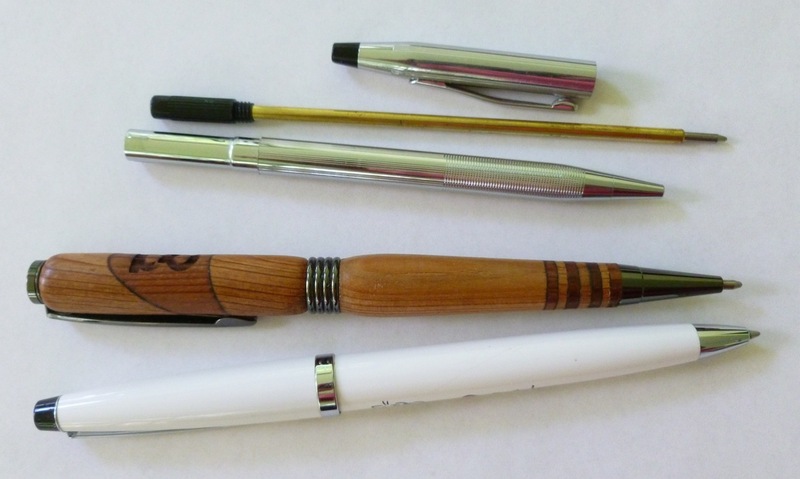 It’s mind boggling..rather than fix the ballpoint refills to sell more Century pens they changed the whole pen to take a different refill type. But then they keep coming out with more pen models and finishes that take their same ballpoint refill..how can they sell well if their own refills are so poor? I ‘m going to try these Fishers refills next in my wife’s ATX …thanks for reminding everyone. WOW…that’s excellent news!! Will have to give it a try!! 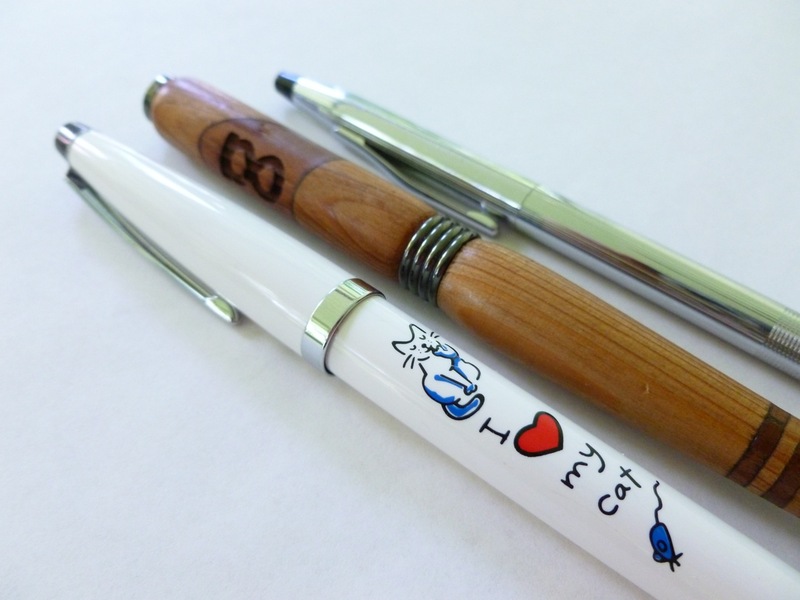 What is the “I love my cat” pen and where did you get it? It’s a Cross brand pen that’s probably 20 years old. I can’t recall where I got it, but I’m glad I did! Love my kitties! Just found out about the Cross Satnink refills.. They sure didn’t advertise them. Maybe we all use our Cross pens again? It’s crazy how they haven’t announced/promoted them!! Tough to find, too…weird. I plan to try some and, yes, hopefully revive my languishing Cross pens!